I am a board certified massage therapist and licensed nail technician. Prior to attending massage school, I had been a medical transcriptionist for 29 years. In the spring of 2007, I decided to give massage therapy a try, in hopes of getting relief from neck and shoulder pain. I felt relief after my first session. After a few weekly sessions, I remember saying to her, “I need to learn massage therapy; I have to be able to give this back to at least one person”. I couldn’t believe the difference! Relief from my symptoms and a sense of deeper relaxation and balance. She encouraged me to pursue a new path. I enrolled in massage school in the fall of 2009 and graduated the following summer. I loved it. From the very first week of school, I knew I had made the right decision. Although I enjoyed all of my classes, Anatomy & Kinesiology was my favorite. This remains true today. The muscles and fascia, joint movement and functionality are all so fascinating and amazing to me. After almost four years of maintaining a thriving massage therapy practice, I began experiencing pain and tingling in my arms from the wear and tear on my wrists, neck and shoulders. I couldn’t begin to entertain the thought that my new career could end so soon. While on vacation, I had the opportunity to experience something different. I made an appointment for ASHIATSU massage. It sounded pretty cool and to think they massage you with their feet! Wow, what an experience! I knew on the table I had to find a class. I was certified in Ashiatsu Oriental Bar Therapy (or “ashi” as we sometimes call it) about 6 months later, in Durham, North Carolina, under the guidance of Julie Marciniak, LMT. I am very passionate about massage and helping others. From general relaxation and rebalancing of the body, emotional, physical, mental and environmental stressors, massage therapy works wonders! I enjoy working on my clients for an hour, 90 minutes, and even 30 minute sessions, which many massage therapists do not offer; I personally believe that “spot work” during a 30-minute session is very beneficial and encourage my clients to work those in between, especially for athletes, those recovering from an injury, or simply building towards maintenance. In the fall of 2013, I had the opportunity to teach my passion thru massage therapy classes at a local college into the spring of 2014. Although I enjoyed this so much, I found myself exhausted after seeing clients all day and teaching at night. I decided that my private practice had to be #1, as my clients were one of the biggest reasons for my success. After expanding my practice in the spring of 2014, I still have the opportunity to share my passion and experience with my teammates. I am so grateful for the opportunity to continue to practice massage therapy, gain additional knowledge in this amazing field and add new “tools” and techniques thru continuing education. The ability to help others and be compassionate to their needs is truly my gift from God. I am blessed to be able to now share my practice with my husband, Tony, who is also a certified massage therapist. My massage techniques also include firm Swedish, myofascial release, trigger point work, active isolated, resisted & passive stretching, and Thermal Palms relaxation massage. With an increased awareness to the benefits of massage among our local athletes and CrossFit arena, I became certified in Sports Massage in October 2015, under the hands-on guidance and direction of Dr. James Mally. After spending the past six years in sales and the six years before that in commercial construction, I was ready for a change of pace and direction in my life. I had the firsthand experience of living with a massage therapist and sharing her passion for this most gratifying career. I wanted to feel the same way she felt after a hard days work; the feeling like you made a difference in someone's life. They felt better physically and mentally, and she felt better emotionally and spiritually. Wow, what a concept! Doing something you love and receiving monetary compensation for it. “Love what you do and you will never work a day in your life!” That never meant anything to me until I started my new career. Now I understand fully the meaning of that and the uplifted feeling Penny experienced. I am fascinated by the human body and what it takes to keep it moving the way it was intended. Shortly after graduation from massage school, I completed my first course of continuing education and received a certification in Fascial Movement Taping and officially became a Rock Doctor or RokDoc for short! Shortly after that, I received my certification for Thermal Palms. A fantastic alternative to hot stones massage. These two certifications are only the tip of the iceberg. I am looking forward to more training in sports massage and therapeutic modalities in the near future. I have been very passionate about massage for as long as I can remember. In 2013, I decided to make this dream a reality. Swedish massage is the basis for all massage and I believe nothing feels better than the feeling of “melting on the table”. I specialize in therapeutic massage and love helping athletes prepare for their workouts and increase their mobility, as well as their recovery thru sports massage. This has led me to my certification in Sports Massage under the direction of James Mally. I can't make you a new person but I can help make you feel like one. For as long as I can remember I have had a passion for helping others. I started my journey in the nursing field. This fulfilled my need to help others but proved to be very stressful on me. In 2013, I discovered a new avenue to fuel this passion and do so in a more peaceful environment, massage therapy. I couldn't be more satisfied with this decision. I look forward to showing you how to relax and feel better! I have been doing what I love for over 20 years now and over 6 of those years as a master stylist with Aveda. Hair styles are always changing so I stay up to date with the latest techniques and trends, while never losing touch with the classics. My specialty is natural hair color. I very much enjoy doing high fashion color trends as well as artistic cutting and styling. The most satisfying part of my job is creating a look specifically designed for your facial shape, coloring, and most importantly, a style that fits your lifestyle. For the past 22 years I have been working in the steel industry, and finding every subsequent year harder on my health and wellbeing. In 2012 I made the decision to start a career move that would hopefully put me on a path to a better future. I began massage therapy. During the year long course I discovered the joy and benefit of massage, not only to my self but the positive impact I could have on other people’s lives. I found massage and all its concepts came very easily to me and after graduating in the 2013, I began teaching at the same school I graduated from. I continued to teach from 2014 to 2017 during the evening time while still working steel during the day. The teaching was both very rewarding and enriching and I greatly enjoyed it. Eventually, the school closed its doors and I was only left with my job in the steel industry. 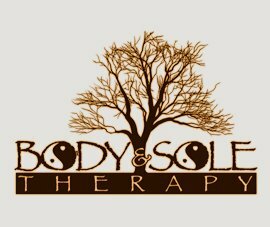 Now I have the wonderful opportunity to continue and focus on my massage therapy career, here at Body & Sole Therapy. I’m happy to say my steel working days are behind me, and I am excited to be able to bring my massage skills and knowledge to help our clients. I look forward to seeing you, come visit soon! Meagan is a Licensed Cosmetologist and Certified Nail Technician. She specializes in Shellac manicures and pedicures, along with basic nail services, and waxing services. She enjoys staying up-to-date on the latest nail trends and nail products through continuing education. Meagan is truly passionate in the nail industry with her nail art and enjoys collaborating with her clients to create the perfect designs just for them! She takes great interest in making sure her clients leave with the feeling they have received professional services in a clean and relaxing environment. Meagan is OPI Gel and CND Shellac Certified. Myrtha is a Licensed Cosmetologist and has been a Certified Nail Technician for 4 years. She specializes in Shellac manicures and pedicures, as well as basic manicures and pedicures, and waxing services. She loves being creative with nail art. Her main goal is for all her clients to walk out completely satisfied, and relaxed, following their appointment. She is OPI Gel and CND Shellac Certified. She loves cats and snacks. Her favorite foods are wings and tacos!